In the board game of Vikings each player gets to lead their own group of vikings. You and your group settle on some islands just off the coast of your homeland. Then, you try to settle the area by getting building yards, churches, fishermen, nobles, and several other professions to join your settlement. You goal in the game of Vikings is to make your settlement the most profitable you can. Don't get too comfortable though, before you know it you just might be attacked by warriors from another settlement. 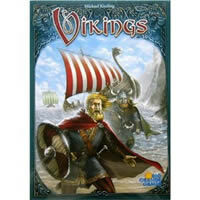 Vikings is a great game for those who like strategy games. Be sure to check out Vikings with your friends. Play Vikings today! The winner of Viking is the player with the most victory points. Your Vikings game should come with game board with wheel, 8 player markers, 1 start player figure, 4 player bases, 45 coins, 1 cloth sack, 4 scoring summaries, 78 vikings, 76 tiles, 25 special tiles, Viking rules and instruction booklet, and an extra page with progress rules. Please keep in mind that the official Vikings board game rules and instructions could be different depending on the game version you have. The rules below are some of the exact directions on how to play Vikings. Share with us your comments, funny stories, tips, advice, strategies, creative ways to play, questions about how to play, problems with the rules or anything you want about Vikings. All submissions will be reviewed within 24 hours. Click here to add your Vikings comments.